← Warre Beehive Update: Save the Queen! Strong, expressive hands – huge spirit – Paul Gautschi shares his love for God and His creation. Paul Gautschi is not a big man in stature, and one cannot help but notice that just walking is difficult for him, as his body is quite crippled from the ravages of Agent Orange. Spend just a few moments with him, however, and you do not see his physical challenges – you only see a strong human being with a profound relationship with the earth and its Creator, a man whose mind knows no limitations. “I think about how hard I used to work to fail.” He chuckles at the thought and shakes his head at his own folly. Paul obviously takes no credit for what he has created, only giving credit to the true Creator. He and his wife, Carol (who, as an aside note, is a well-known midwife and delivered my latest granddaughter), bought some land years ago on the Olympic Peninsula, Washington State, in an area that was probably quite remote at the time. The problem was, though, that they dug a well over 200 feet and it only produced ½ gallon per minute – and the “soil” was a rocky thin layer over hardpan. Hmmm. He realized the trees were huge – with no help whatsoever from mankind. No irrigation. No plowing or tilling. No weeding. No applied fertilizers. “I can do this,” he said – and from then on, his approach to gardening changed from slave labor to letting Nature do the work for him. Back to the present: we are visiting his homestead on a field trip as part of a Conservation District Native Landscaping class. The first step, he noted, talking about those early days, was to layer things on top – and more specifically, wood chip mulch – not just bark or just inner chips of wood, but the whole tree, including green leaves and branches, similar to how Nature drops a combination of needles, leaves, branches, and trees over time. He was just speeding up the process. This combination of green and brown, he says, is essential to keeping things in balance. 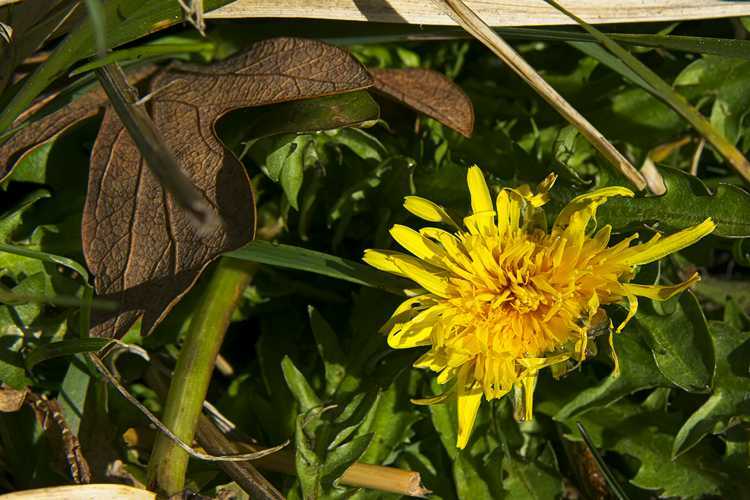 It also provides a nice texture, unlike hay or grass clippings, which tend to get slimy and compacted and may contain seeds. “I haven’t watered this orchard in 33 years,” he says. He rakes across the top of the mulch to reveal black, mineral-rich soil. Paul is a Certified Master Arborist, but does not own a chipper. “Just another machine requiring fuel,” he says. It makes much more sense to utilize what would otherwise be a waste product from road crews and other sources. “Look at nature,” he explains. “Nature doesn’t like bare ground. If there is bare ground, something will move in and cover it. Soil is a living organism,” he emphasizes. “It should never be exposed. Whether by scales, fur, or skin – every living thing is covered.” All materials are placed on top. In fact, in the fall, he just covers up his strawberries with more woodchip mulch. Healthy young plants come up every year. One student makes the comment that she feels badly that we are all standing in his garden, a big no-no for most Pacific Northwest soils in wet, late April. “You can’t compact this stuff!” he exclaims. I look around and notice that most of us are lightly bouncing in place on what is like a giant cushion. He points to his orchard. The “dwarf” trees are really quite large (no one tells you how big they’ll get if grown in compost – they don’t know!). The roots spread out unencumbered. The branches, instead of growing upward, bend down toward the earth. The roots have an easier time reaching the water, which is then transported to the fruit. “The fruits are so full of juice and so heavy that they weigh the branches downward – where they are easier for me to pick,” he adds. “Like nature intended,” we all say in our minds. We are catching on. The soil just beneath the top layer of chips is incredible – soft, moist, dark, and rich. He encourages us all to take a handful and smell it. “You can literally smell the minerals in this soil,” he exclaims. His enthusiasm and the wonder at the perfectness of nature are catching. 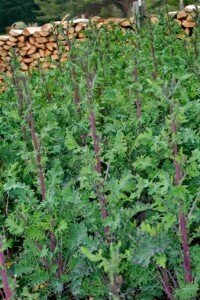 Sweet Russian Kale – SO good! It is the end of April, and he guides us to a patch of Russian kale planted a year ago beneath a cherry tree. “The tree gives it protection over the winter,” he says. He clips us all a little sample. It is juicy and surprisingly sweet. “Come on over here to the asparagus…” We eagerly follow. This is the best tour ever. The asparagus is literally dripping juices. He comments about the wonders of nature and its perfect sense of timing: asparagus has roots that can mine minerals 15 feet down into the ground. It comes up in the spring when hardly anything else is growing, when we most need something fresh, green, and nourishing. “When you cut the plant off from its life source, it immediately begins to die,” he explains. Within 10 minutes, it doesn’t have near the vitality it did before. By growing your own food, you can harvest and eat it right there for optimum nutrition. His explanation makes perfect sense to me. We all can’t help but notice that he also has a lush patch of parsley and cilantro that have overwintered. I help myself to a nibble of the fragrant cilantro. 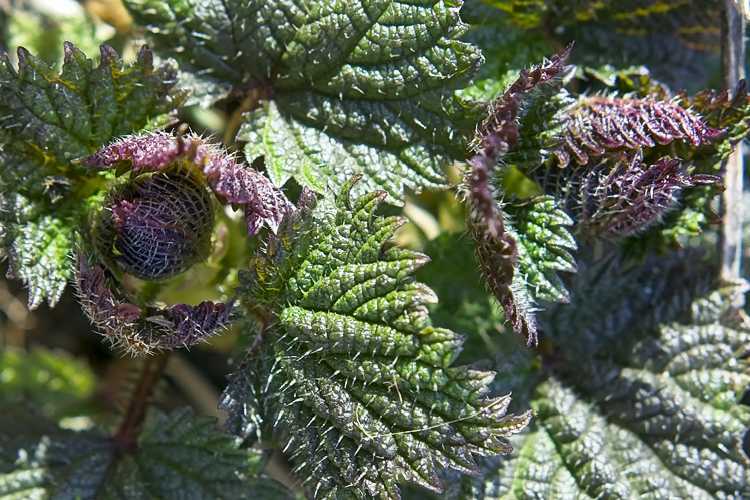 I love this stuff – and when I plant it in spring, it usually bolts before I harvest much. Paul Gautschi leans against a rake, taking questions from our tour group and sharing what he has observed and has worked for him. Click here to visit Dana & Sarah Films to buy the “Back to Eden” DVD! But of course, a vegetable can only be as nutritious as the soil in which it is grown. Many agricultural practices only deplete the soil further and further, unlike the mulch applications that continue to build the soil, year after year. Done right, you can use less and less and get more in return (“at about the time we are getting older and can’t do as much,” he notes as another example of perfect timing). “You don’t have to mix it all up,” he says. “All that needless work, and so destructive! Tilling is like sending a hurricane through the environment! God doesn’t till. He just lays everything on top. When you mix it up, that’s when it ties up the nitrogen. It brings too much oxygen into the soil and the microbes burn up the nutrients too quickly, leaving nothing for the next season.” He points to the lush grass on the edges of the mulch. “Does that grass look like it doesn’t get nitrogen?” he asks. He recalls how much work he used to do tilling, trying to break up the layer of hardpan beneath. The process only brought more weed seeds to the surface, which then required more tilling – a never-ending process. He shakes his head again, thinking how hard he worked against nature’s way. It was like God was saying, “I sent all those worms to break up your hardpan, and you kept killing them with your tiller.” The evidence is clear: cultivation is destroying our topsoil, and despite the obvious, people are still doing it, and on a very large scale. 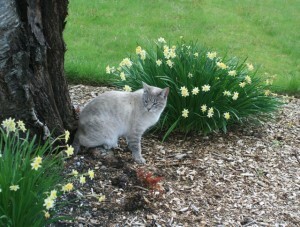 Another Mouser – these daffodils just grow on their own – and look at that grass on the border! No lack of nitrogen there! 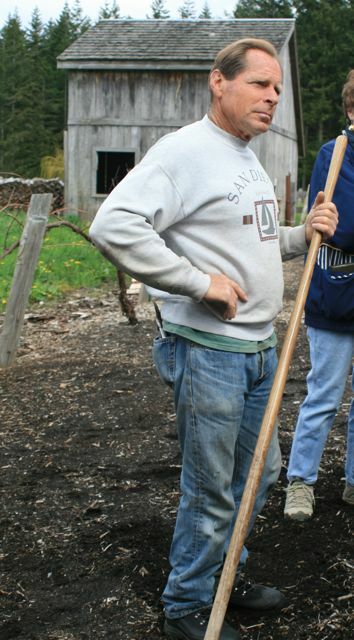 Paul doesn’t bother thinning his vegetables – too much work! And what a waste! The soil is so loose, they naturally just move each other out of the way. He doesn’t need to hill potatoes; they, too, just move to where they need to grow. He doesn’t rotate his garlic. “God doesn’t rotate crops,” he explains. “Why should I?” I notice no quackgrass, no bindweed, no real insect issues. I like this guy. And I love his methods. I am tempted to spend the afternoon in his parsley patch, but right now, we are headed to see the chickens, who are busy with their waste management duties. “Everything in nature is in total harmony,” he explains as we walk. “We (meaning mankind) take out the best. Nature, though, takes out the weak.” So when he harvests potatoes, he puts the best ones back. His crop improves every year. Throughout our tour, I am marveling at how this man with so many physical challenges, manages to achieve so much. “I let nature do the work for me,” he repeats. But even more extraordinary than what he has accomplished is his deep connection to the land, his reverence to God, and the continual sense of awe in His creation. His source of inspiration truly emanates from his being. The lessons seem so obvious to those of us who slave to force our gardens into submission, rapid growth, and our contrived sense of pedigreed perfection. Yes, it IS that simple. Just layer it on top. It builds the soil; it conserves water; it releases nutrients gradually. Plants grow together in harmony. And as Paul Gautschi illustrates, we can reap from this bounty, with enough left over to feed our neighbors and give back to the earth. Permaculture is hardly an original idea. Nature has been doing it on her own since time began. Maybe it is time to take a walk in the woods. Take a little closer look around us. Witness. Communicate with the Powers that Be. Listen. Learn. Share. Stand back in wonder. Be humbled. Paul Gautschi’s approach and methods have recently been featured in a film, “Back to Eden,” which is currently being translated into several different languages – including Swahili! If you would like to buy the “Back to Eden” DVD, click here to visit Dana & Sarah Films. Happy International Permaculture Day everyone! 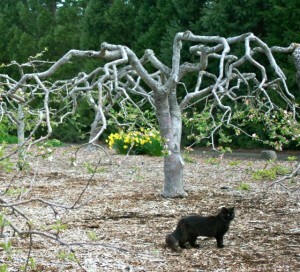 So glad to have come across your site and lovely account of touring Paul’s gardens & orchard. 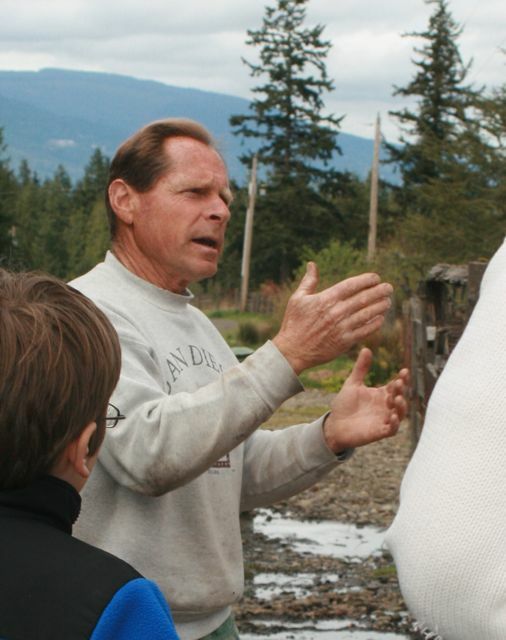 Last month, I published the official biography of Paul Gautschi called GROWING FOOD GOD’S WAY. It is a 255pp paperback. Paul wrote the Introduction and Joel Salatin wrote the Foreword. Much of what you share is expanded in the chapter called: It Takes a Village (of animals and organisms). At this point, all the books from the 1st printing are out already (amongst 7 countries and 114 US cities). People can read three chapters free on the website (including It Takes a Village).Folks use the website to essentially get on a waiting list to get one or more copies from a future 2nd printing. Hi David – Glad you found my site! I just placed an order for your book and am very much looking forward to reading and sharing it. Hope the 2nd printing is out soon. In the meantime, I encourage people to visit your site at . Best of luck to you on your book and other endeavors! I loved this page,,, gives me some ideas. Good to hear from you again, Harvey! Hope the added mulch works out for you & makes your gardening super easy! And yes, the garlic definitely keeps the blood flowing, which, as far as I can tell, is a Good thing in this life! This is Paul’s Back to Eden Site. where his technique/philosophy video can be seen. Last Fall I converted the garden to this …. Excluding only potatoes and garlic. IF the Chinese Pink garlic scapes this year, they will probably start to show by the first week of June….they’re down turning and inconspicuous. Our Winter was warm so they may not scape. Thanks for the link, Bob – (I have it above, too, but it doesn’t stand out very well). For other readers: Bob’s link takes you to the interactive mapping page where people are posting where they live and sharing their gardens – very cool! Hope this takes off. Link to the film on the upper right. “It’s all about the covering.” I am always learning! It’s hard to find enough woodchips, though, is my only problem! By the way – my Chinese Pinks are showing yellowing of the bottom leaves! I dug down around a bulb and don’t see anything wrong, but it seems waaaay early to be maturing! I might give them a little fish fertilizer to see if they perk up – but I feel like a newbie all over again, stressing over whether they’re ok! (Does this feeling ever go away?) BTW – Glad to hear your bulbils are up! And yes, the bees are such a fun adventure! They are doing great!